George had a large, damaging issue of a leaking basement that caused mold growth, and damage to his belongings and the home itself. He contacted MidAmerica Basement Systems to have his issue addressed. It was offered installing CleanSpace, BrightWall, WaterGuard, a SaniDry Sedona, and a TripleSafe. The CleanSpace and BrightWall worked together to redirect the seeping wall water to the WaterGuard, while reducing moisture and making the walls more appealing. WaterGuard helped collect and relocate the water to the TripleSafe sump where it would be discharged out of the basement. The SaniDry Sedona helped keep the humidity levels under control, to help prevent future mold growth. Donna and Carl were concerned of the musty, moldy smell throughout their home. They thought it might be coming from the basement but didn’t know where. When they reached out to MidAmerica Basement Systems to have the area inspected, a proper and effective waterproofing system was proposed. Chris had explained that the old walls and floors had begun to leak, causing water to puddle and pool, leading to the growth of mold. CleanSpace Liner was offered to be placed along the walls to seal off water and create a barrier to help prevent future mold growth. WaterGuard was placed along the wall and floors joints to collect water from the walls and floor and redirect it to a SuperSump. Now the seeping water can be properly redirected out of the home, leaving the basement dry, reducing the musty, moldy smell, and leaving Donna and Carl with a healthier smelling home. Homeowner Steve was concerned about the radon levels in his home. When he contacted MidAmerica Basement Systems, he was eager to meet with Design Specialist Dan Garner. Dan gave him the best options on radon mitigation for his home. Needing a large, permanent dehumidifier for my finished basement. Would like to purchase one real soon for myself to install or have you install it. He (the design specialist) was excellent in working with me, quickly providing me various options and their costs so I found the right choice matching my needs and budget. The office staff was very helpful with questions. All of the employees were amazing and friendly. Ryan was excellent. He is very knowledgeable about the products, services, and installation. "Good job so far...proof will be in the pudding as they..."
If you think you might have radon gas seeping into your home, it's time to take action. 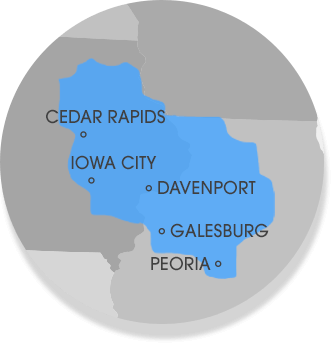 We help homeowners in Oglesby, IL with radon testing, and can even provide a FREE quote for the cost of a radon mitigation system for your home. The basement and crawlspace are now dry, preventing future mold growth and moisture issues. The SuperSump is ready to discharge any moisture or water that enters the basement. WaterGuard and CleanSpace are installed to reduce and redirect moisture to the SuperSump. Homeowner Luann has recently contacted MidAmerica Basement System to learn more about basement waterproofing. Her basement was experiencing a water problem that she feared was going to damage her home if she did not have it addresses as soon as possible. She has had a full perimeter waterproofing system installed to help keep her home dry and safe. The new WaterGuard system is installed along all of the exterior walls and will lead to the sump pump where it will be pumped out of the home. Along with the WaterGuard system and the sump pump, CleanSpace is installed to create a water barrier that will keep the home dry. Homeowner Steve was concerned about the radon levels in his home. When he contacted MidAmerica Basement Systems, he was eager to meet with Design Specialist Dan Garner. Dan gave him the best options on radon mitigation for his home. Design Specialist Dan Garner educated them on radon mitigation systems and why they were needed in their home. Radon is the second leading cause of lung cancer in the United States. The EPA recommends that testing is done in the lowest point of your home. This represents an area where the greatest level of radon occurs. Donna and Carl had recently had their basement waterproofed by MidAmerica Basement Systems and were looking to fix their old, leaking basement windows as well. After their windows were replaced with new EverLast Windows, SunHouse Window Enclosures were added. The SunHouse not only prevents weeds and debris from collecting and growing in the wells, but offers a more reflective base to bring in more natural light for the basement. The new enclosed window wells have aided in keeping the basement dry and has definitely brightened the basement. Leaking foundation can lead to damaging walls and mold growth when left unattended, which will only worsen over time. Having the proper waterproofing system installed from MidAmerica Basement Systems will allow for a healthier home. One option for leaking foundations can be CleanSpace Liner. The thick liner offers a vapor barrier for the basement, reducing the moisture levels in the air. Lower moisture levels will keep the rest of the home’s structure safe, extending the life of the home. To aid in the CleanSpace system, WaterGuard and a TripleSafe or SuperSump pump is installed to keep the water out of the basement, and keep the area dry. Leaking basement in Oglesby, IL has left homeowner George a mess. He quickly contacted the experts at MidAmerica Basement Systems to have his basement inspected. During his evaluation, it was suggested that a TripleSafe, WaterGuard and BrightWall be installed. The WaterGuard and BrightWall help collect and direct water that has enter the foundation, preventing it from surfacing. BrightWall also acts as a moisture barrier, helping prevent future mold and mildew growth. Once the water reaches the TripleSafe, it is discharged, leaving the basement dry. A SaniDry Sedona was also installed to keep humidity levels under control, helping with the prevention of mold and mildew growth as well. Pat had recently installed a waterproofing system in his basement and was ready to start finishing his basement. He had heard of the BrightWall wall panels offered by MidAmerica Basement Systems. The BrightWall wall panel system provides many advantages for your basement. They are 100% waterproof and washable, while creating a vapor barrier between the concrete foundation walls and the rest of your basement. Due to the panels being white, it provides a brighter, cleaner-looking area, utilizing as much light as possible. Pat now has a good start base to his soon-to-be finished basement. Alicia was ready to sell her home but had an issue with a leaking basement. She contacted MidAmerica Basement Systems to have the issue fixed before she put her home on the market. Crewmen quickly installed a TripleSafe Sump. The TripleSafe provides a three-sump system to effectively keep the basement dry. With its primary and secondary systems, no amount of water leakage will prevent the system from backing up. The third pump, a battery backup system, provides even more security during power outages. Alicia’s new waterproof system will increase the value of her home when she sells thanks to the help from MidAmerica Basement Systems.